A Boston College product, Darren Flutie joined the BC Lions midway through the 1991 season after 2 ½ seasons in the National Football League. During his five years with the Lions, Flutie exceeded the thousand yard receiving mark three times with his best season coming in 1994 when he caught 111 passes for 1,731 yards. As a lion, Flutie was named All-Western in 1992 and 1994 and was a member of BC’s 1994 Grey Cup championship team. In 1996, Flutie signed with the Edmonton Eskimos to keep playing with the quarterback with whom he enjoyed most of his success, Danny McManus. While in Edmonton, Flutie gained more than 1,300 yards receiving during his two seasons and was a member of Edmonton’s 1996 Grey Cup team. In 1998, Flutie and McManus took their act to Hamilton. 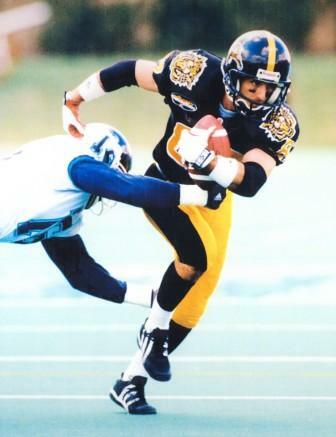 As a Tiger-Cat, Flutie was a member of Hamilton’s 1999 Grey Cup championship squad. Darren flutie played in 193 regular season games, catching 972 passes for 14,359 yards and 66 touchdowns. He also played in 14 playoff and Grey Cup games, where he caught 75 passes for 1,500 yards and 11 touchdowns. On October 14, 2002 he became the CFL’s all-time pass receptions leader. He retired from the CFL following the 2002.